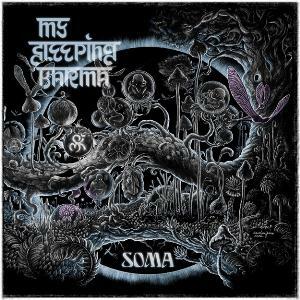 Soma is the fourth album by German groove rockers My Sleeping Karma. Eschewing vocals in favour of layered soundscapes of chilled out psychedelia and ambient waves of beauty, the four piece sound like Tool at their most relaxed – sweeping crescendos of rhythm and looping rock riffs followed by short interludes of white noise like ‘breather tracks’. This is an album most appreciated in one sitting. It’s a long journey, clocking in at almost an hour of relaxing grooves, but certainly one worth undertaking. The production is crisp and the experimental waves of sound that texture every track sound professional and compliment the music perfectly. The sleeve is a mixture of Eastern tinged imagery and a psychedelic circle of life, hinting at the underlying themes and influences that flavour this bands music. It’s difficult as a reviewer to highlight or recommend specific tracks as they are all similar (in a good way!). Soma should be experienced, with the high points of the complete package subject to each individual listeners opinion. For example, the images I felt listening to ‘Interlude’ (track 6) will be very different from anyone else, yet the effect that music had on me coloured the next track…whereas another listener may be drawn to the thundering drums of Somalatha or inversely, to the serene stillness of the second track. Music is notoriously difficult to quantify, but if you are drawn to bands such as Tool, Isis, This Will Destroy You & suchlike, the relaxing grooves of My Sleeping Karma will be worthy of you attention. This entry was posted on 3rd December 2012 at 11:42 pm and is filed under CD, Rock with tags Ambient music, groove, Isis, My Sleeping Karma, Post-rock, Soma, Tool. You can follow any responses to this entry through the RSS 2.0 feed. You can leave a response, or trackback from your own site.